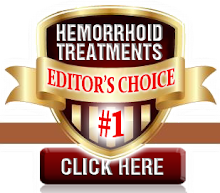 There are many different treatment options for treating hemorrhoids. There isn't one method that will work for everyone, so each person may try different methods until they find one that works best for them. Natural Home Remedies - Treating your hemorrhoids from home naturally is the best choice to begin with. Most people can treat their hemorrhoids from home successfully without the need of any medications. Over-The-Counter Medications - Some doctors may recommend certain creams or other over the counter medication for symptom relief. This is more of a temporary treatment to help you get rid of symptoms such as itching. Small Procedures - Usually if the above methods haven't worked then your doctor may recommend other small procedures such as rubber band ligation, laser removal, or chemical injection. Surgery - If everything else fails and you just can't stand the pain then surgery might be an option. There is always risk with any surgery so we only recommend this method if everything else has failed.